Dolffanog Fawr is a haven for anglers. Some of the best fishing in Wales is near by. The trout fishing opportunities are endless. Tal-y-llyn is stocked with brown trout to supplement the native wild fish, and at the right time of year the sport is sensational and has to be one of the best fishing locations in Britain. There are countless mountain lakes that contain wild brown trout. A day spent exploring some of these is never wasted. Indeed, Alex can often be found floating around these lakes in his float tube. Some are by the roadside, others can be accessed by 4×4 on rough mountain tracks and the rest involve varying lengths of walk through dramatic mountain scenery. Wales has as much to offer the wild trout angler as the highlands of Scotland. Four of the top salmon and sea-trout rivers in Wales are within a ten minute drive. The Dyfi, Dysynni,Mawddach and Wnion are all prolific when conditions are favourable and can all fished on a day ticket basis. We offer complementary fishing for guests on over 13 miles of the Mawddach and Wnion. The lower Dyfi is controlled and managed by the New Dyfi Fisheries Association and is available to visiting anglers only on a weekly ticket purchased in advance. The upper reaches can be fished on a day ticket basis and can be excellent value during or just after a flood. Flows out of Tal-y-llyn and into the sea at Tywyn. It is a lovely little river that produces surprisingly large fish. 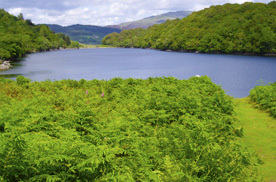 Large sections of these rivers are controlled by The Dolgellau Angling Association. The rivers provide some excellent fishing whether you prefer spinning, bait or fly fishing. 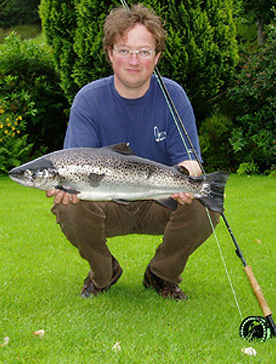 Several years ago the Mawddach produced an awesome sea-trout of 21lbs. The upper Mawddachand Wnion are excellent for worming and the lower Wnion offers some majestic fly water. 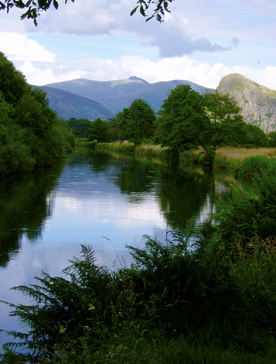 Guests at DolffanogFawr are entitled to complimentary fishing on these rivers. We can’t promise you 20’s or even doubles but fish of up to 5lbs appear quite regularly. Even if you don’t catch anything there is nothing like being on the river bank at night with fish of all sizes jumping around you. The Dee at Bala is just over ½ an hour away and at the right time of year offers some of the best grayling fishing in the UK. Fish over 2lbs are regularly caught with much bigger fish present. A sunny September afternoon dry fly fishing on the Dee should not be missed. There are some superb opportunities for saltwater fly-fishing off the coast in this part of Wales. The main targets are bass, mullet and mackerel. Although the mullet can be difficult to catch on the fly, they can be tempted by ragworm or mackerel strip. The bass fishing off the coast is prolific especially at dusk, when the fish come right into the margins chasing fry. Standing up to waist in the dark with waves and fish crashing all around is an experience not to be missed.